What was new about the program? The program used a powerful yet simple demonstration tool – the glow germ demo kit – to make visible the germs on hands that look clean, but were not washed with soap. Visibly clean is not really clean. Establish the presence of germs even on clean-looking hands, using a simple but extremely powerful, low-cost demonstration tool called the “glow germ demo kit.” Developed by Unilever for use in Swasthya Chetna, it brings to the target audience the idea that hands are only truly clean if washed with soap. Establish the consequences of these hidden germs on hands. 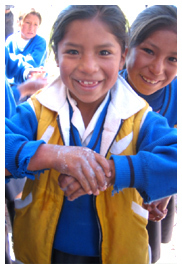 importance of washing hands with soap and to promote general hygiene in rural villages. The program has reached more than 100 million people, and its teams have reached at least 44,000 villages in rural India. Swasthya Chetna is one of the world’s largest self-sustained and self-funded hygiene promotion projects. the topic or activity fun and involving. The tools to communicate the central Swasthya Chetna message are adapted according to the specific audience, and schools have proven excellent entry points into communities. The element of Swasthya Chetna that involves children focuses on how to position hygiene as fun and uses stories, games, songs and quizzes. can be made to the subsequent year’s program to make it more effective in achieving its goals. Cost-effectiveness of the program – the cost per village is approximately £50 for the three exposures, including implementation and development of the materials. Commitment of the operating company – Swasthya Chetna is now central to what the brand does in India, and the operating company (Hindustan Unilever Limited) has invested more than US$5 million.